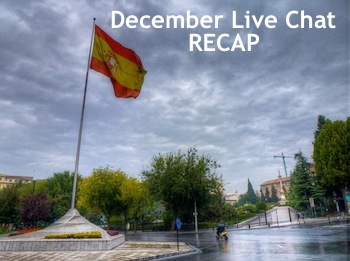 Hello and welcome to the first of December and my second live chat. Today I’m excited to introduce you to Daniel Galan and Arantxa Ros; both Spain and social media professionals. That’s where you’ll also find the best comments from November and talk Spain with my two guests both of whom I met on separate occasions in Granada and Valencia. Arantxa is the engine behind several of Spain’s recent blog and press trips; one of which brought me to Valencia back in June. She’s on the forefront of Spain’s efforts in this area which is changing how countries look at social media and currently working in collaboration with Girona’s Tourist Board. Daniel works at Turismo Ciudad de Granada and knows this southern Spanish city and Andalusia very well. He’s helped travelers of all types and budgets have wonderful visits to Spain that are often powered by endless tapas. I met Daniel back in March at a conference in Bulgaria of all places and caught up with him again in Granada last month. Want to talk social media, Spain, or simply talk travel? Now’s your chance, I’ve got drink in hand and two great guests for our conversation. Click here to jump into the comments and chat below! Denise adds this Asian nation might be as overlooked as Chile, Oman, and North Cyprus. Don’t worry Emily in Chile, your secret’s safe with me. Speaking of gadgets, Scott Quirky Travel Guy is having some trouble decided between two digital cameras, got any advice for him? Hi Arantxa, welcome to that chat! Happen to know anything about longer-term travel visas to Spain? Tom has some questions about it below. Hi Daniel, just got the last bug worked out I think – glad to have you here! How are things today? Today has been a bit stressing day as Ive been getting everything sorted out for this week missing from office as I’ve been promoting Granada in our twin city Aix-en-Provence, France. hows been your day anyway? preparing everything for todays chat I imagine! It’s been good, though sometimes I over-prepare. Think I only had 5 technical mistakes along the way! An improvement over last time. Right now I’m in travel-limbo, lots of my plans going haywire so freezing in Germany instead until my next move. Where do most of Granada’s visitors come from? Big French connection? Hi guys! Admittingly I don’t know much about Granada as I’ve only been to Spain once. But I’m going to be in Spain again in May this year to walk the Camino de Santiago. I might have time after/before to explore a bit more. Since I love photography and cultural events – are there any great festivals going on around that time in Granada (May/June) or surroundings? If you come that week, Granada will welcome you all decorated with a lively city centre full of lights and adornments. Highly recommended visit for that time of the year! it is! a whole week of culture, animation and honestly not long sleeping! You should go to Scandinavia – Denmark – show a poster of the sun. Tell everyone that it’s hiding in Granada 🙂 That trick probably will work in Russia too. absolutely right! not to mention that we have great beaches just 45min drive from the very city center! I forgot to mention, the easiest way to follow along is to check ‘subscribe to comments’ below. I was working on coding up a refreshing chat interface but maybe next month! well, its good enough for our afternoon! By the way, thanks you chose a pic of our Avenida de la Constitución and its flag. It’s one of the “starting points” of the old city of Granada. Hi, I have a general question about cost of living…I’m interested in doing a CELTA course in Spain, which would be 4 weeks, I think. Is it pretty easy to live in Spain short term as a student, just living off my savings? Can you give me a ballpark figure of approximately how much money I would need if my travel plans include mostly staying in hostels and eating cheap? Thanks! Hi Lynn! well cost of living varies from city to city. Ill talk about Granada which lies in the South and is generally cheaper than other places in the north. You will get a cheap hostel from 15 euro. but if your staying for a month you may be interested in getting a room in a shares flat with other students. Prices go from 150euro/room/month to 300euro (depending on the area of the city and the qualities of the appartment). 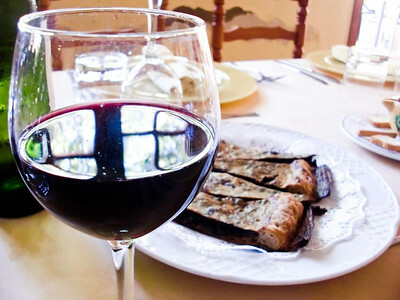 Eating in Granada is as cheap as you want. 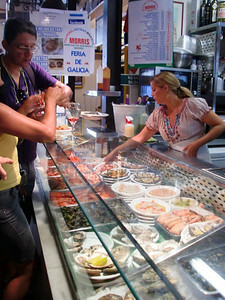 Restaurants in the city centre have daily set menus at around 10-15 euro. You also have tapas which you can get for free in every bar (with a couple of drinks you will have a proper meal!). Supermarkets are also cheap in Granada. Prices in the whole of Andalusia (our region) dont vary greatly. Bigger cities such as Seville or Málaga will be obviously a bit (but just a little bit) more expensive, whilst villages will be cheaper. The tapas with every drink are a great deal in Granada; I found it surprisingly inexpensive for a city in western Europe. 2 euro (aprox.) for a beer/softdrink + a portion of food will allow you to get a 4euro meal if you want. Thank you so much guys…This information is really helpful! Along the Camino, I was finding a caña for about 1.20€, but not much in the way of tapas. A plate of olives was usually another 1€. More in Madrid, obviously. Hi all. I’m just back from Spain where I spent time in Madrid and Bilbao, and oh yeah, did the Camino starting at St. Jean Pied de Port. Also lived there for 2 years a long time ago. My favorite country in the world. Had to leave because of the 90 day visa restrictions. Any hints on how to get around the Schengen restrictions and spend more time in Spain. The residence process is quite a lot more onerous than it used to be…and it seems the consul wants to keep my passport for four months while they thing about it. Hi Tom, sorry but I dont really know any other easy way to sort out that problem besides going back to your country and come back. Maybe Anil can be more useful in that field! What you think Anil? Do you carry a US passport? Are the visa restrictions 90 days in Spain or 90 days in Europe? Curious as I was considering at least 90 days in Europe this spring and part of that being Spain. My understanding is 90 days total in the Schengen countries. Then you have to leave for 90 days before returning for another 90 days. The only two ways to extend it that I know of are to go for a long-term (6 month) visa – which typically requires a strong business reason and some company endorsement or a residency visa. It’s the countries in blue (the green are joining soon). I think you’ve got the best chance with Spain’s business visa. I can imagine there’s some economic incentive there as well for them. But you have to apply for that type of visa with each individual country is my understanding. Yes, and it seems Spain also wants to hold my passport for four months while they think about it in Madrid. Huge pain. Back in the old days, you hired a gestor in Spain and they could accomplish the residence in about a week. Yes, for the ease the Schengen zone has brought tourism, it’s really a shame and a bit foolish to only allow 90 days out of every 180 in such a huge area encompassing so many countries. how long do you have to leave for before you come back? I had been planning Italy, Germany, and Spain…but may have to re-think! You have to be out for 90 days. Yes, please. If you have any info, please let me know. You have to be out for 90 if you’ve been in for 90. If you’ve only been in for 50, you have 40 left before you have to leave for 90. Sorry is this is a dupe. Any suggestions for short circuiting the visa process? I used my 90 days in the Schengen countries and, as I understand it, can’t come back for 90 days. That’s true – I don’t know of a good way to speed up the process for a long term visa; the only one I know of is the expedited business visa. Will the tourist people help with that, if I’m writing a book about the Camino (I am) and I need to do some more research? Thanks, I’ll try that. The consul in Chicago is not very helpful at all. Fill out the form and wait is their motto. you mean with a bussines visa? Residence. We’re “jubilados” but have to go through FBI check, health check, etc. then once that is done, have to wait for approval from Madrid, during which the consul holds your passport. We’re told that can take four months, and I really don’t want to be restricted from traveling for that long. Maybe business visa is the way to go, if that’s less of a problem. How is the chat going? Going well, Arantxa, are you subscribed to the comments? let me tell you Arantxa that I visited Girona last September for the first time and I fell in love with the city! Thanks Brooks! It is actually a great country! Did you visit Granada or Girona? @Arantxa – Great to (see) you here too! Hope you are well! I did for part of a day to visit a few friends, but doesn’t really count 🙂 As soon as I can scamper across the pond, it’ll definitely be on my list. Girona is a beautiful place to visit, in fact Spain is awesome, lots of contrasts, plenty of festivities, art and history, wine and gastronomy, modernity and traditions, Spain is AWESOME! If there’s one thing that endears me to Spain, it’s the love it’s people have for it. A Mediterranean trait I’m drawn to and it only adds to the incredibly warm feeling the Spanish give you when there. How can’t we love our country? Just have a look to the past, everybody wanted to conquer Spain, Romans, Arabs…. Did you know that Girona and Granada are the only provinces in Spain where you can ski and have a swim in the sea? Looking for two types of music. Arantxa, Daniel, if there were one song or type of music to define your parts of Spain, what would they be? Flamenco of course is the Music defining both Granada and Andalusia. Originary of the gipsies that started living in the Sacromonte, the caves district of Granada right after the Christian conquest of the old Arab Kingdom. Also (and surprisingly for most that visit us) jazz is also a defining music of Granada. We have one of the most important Jazz Festivals in Spain in November… if you are into this music you cant miss it out! This a bit old, but is still fantastic. cool!! also flamenco versions of caribean rithems. Aren’t we lucky??!! Every Summer in Granada you can experience the Flamenco Fussion in the gardens of the Generalife, one of the parts of the Alhambra! and its really amazing! not only for the show but also for the place! Sorry I’m late, only just found out about the chat. Eager to learn more about Spain though. So far I’ve only been to Madrid but fell in love with the country right away. Reading stories from fellow travel bloggers has been a great way to learn more about areas of the country I had never heard of before. Where are you traveling these days? Every region in Spain has its own charm, wonderful places and distinctive character! Hi Matt, happy to have you here 🙂 Spain is one of those countries that almost writes for itself…! I would also add that in my travels, the Spanish are the most lovely world travelers. So polite, kinda and full of laughter and joy! I always smile when I learn someone’s from Spain. Like they are at home. The Spanish are the most welcoming people I’ve encountered. And, they aren’t always trying to sell you something. I’ll go grab some wine – this chat is slowly turning into a party. There’s music above and now we’re talking food…that says Spain to me! 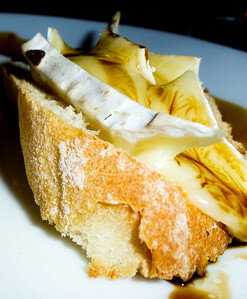 Food and music are two pillars defining the Spanish culture! And two fields that Spaniards love to show to the world and that really enjoy talking about! Arantxa, looking back on the year and forward to 2012, I’m curious how you think Spain has been able to work in social media and if it’s set to grow in the coming year? In your circles are people seeing the return they’re looking for? That’s good to hear and I think Spain is leading the way in this front. I see many other countries (some I would not have expected like Jordan) really following Spain’s lead. From my (blogger) perspective, it really encourages me creatively because it fuses technology, travel, and gets me working with people who understand how to put the two together to encourage tourism. As of Granada, were slowing but increasingly working social media. We opened our profiles on the main social media and integrated them in our webpage. We also have the figure of community manager who answers and dialogues with anyone whos interested in Granada. Ive heard Girona-Costa Brava is working hardly in this line, isnt it? I noticed that on your page right away. I’m not sure I can speak for everyone or many (would be interested to hear thoughts) but the first things I tend to look for on a page now (travel, tourism, blog, otherwise) are the Twitter and Facebook links. Then the about – tells me sooooo much about how it will be to work with a given company and how much they “get”. Dropping in to say hello. I adore Spain. Barcelona is one of my favorite cities – I went for a few days when I was in my 20s and ended up staying two weeks! I write quite a bit about food, and would love to visit the Basque region to taste the exciting things that are going on up there. What’s the next El Bulli? You have to try Celler Can Roca, fascinating! Would love to know more about Flamenco dancing there…any great dancing events or recommendations on where you can take lessons in Spain? Not only would I love to learn it – but also photograph it! It takes place always during the first week of December! That’s how everyone stays warm there in the winter! a good session of Flamenco after (or before) some tapas in our bars! who said Winter? Another question on food; you may have already covered this… I’m mostly vegetarian, but not religious about it. What are the options for vegetarians in Spain? I have heard the food is amazing and I’m just curious if it extends to meatless meals. I’m definitely looking forward to the wine! As wide as you can imagine, paella, can perfectly be made without meat or fish, Spanish omelet the same, wonderful salads, escalivada, creams and soups, a never ending choice for vegies! Granada’s food is very rich and you will get some opportunity to get meals without meat in almost every restaurant. Dont expect to find many restaurants advertising themselves as “Vegetarians”. As for tapas, most of them will have no-meat tapas but if you go to some selected ones, such us the Rojo Bar, for example, you will find special tapas “for vegetarians”, meaning special for them, not just accidentaly not having meet in them. I’m a very non-strict vegetarian (as you can see by the amount of meat I ate in Spain) but there are options; and creative ones at that. There’s quite a bit of variety which makes it much easier not to get bored with the cuisine if you don’t eat meat. One question I have – what are the most unexplored or least visited parts of Spain. Many people ask me the “off-beat” things to do and places to go, what would they be for Spain? I would definetely say: Extremadura. I was born and raised in that South-Western region of Spain until I moved to Granada. Amazing cuisine, undiscovered little Medieval towns, amazing landscapes. -Roman Theatre and Amphitheatre in Mérida. -The montanious area of Las Hurdes. I also would like to mention Tenerife’s Carnival the moost colourful party ever!! It is a great party indeed! Looking ahead to December, January, Feb. what tips should travelers who might be considering Spain look out for? Winter is actually a great time to visit Southern Spain as you will not get the heat of Summer. Granada might be a bit chilly at night but in turn you will get an impressive view of the Sierra Nevada mountain range. If your a ski fan, dont miss our ski resort, the southernmost in Europe. Gastronomy in these months is also a plus: the “Olla de San Antón” and the “Cuajada de Carnaval” are two delicacies only to be tasted in January and February. In December Granada has also its Christmas market and in New Year’s Eve, thanks to its young population (we have one of the most important Universities in Spain and the one that receives most Erasmus students in Europe) you will find loads of party! As we’re winding down here, first of all I want to thank Daniel and Arantxa very, very much for spending part of their day and valuable time with us. Arantxa, Daniel, if you have any messages, upcoming events, or links we should know about please feel free to leave them here. Again, thank you very much for your time and invaluable information. It has been a blast and look forward to meeting you both soon somewhere (hopefully Spain) in the world! Its a pleasure to chat here with you and your readers. Its me who has to thank you for the invitation. And it has also been a pleasure to get to “know” Arantxa… hope one day we meet in person! I hope Ive been of help to everybody. If anybody needs further information of Granada please feel free to contact our Tourist Information Office at [email protected] or via our profiles on Twitter (@granadaturismo) or Facebook (www.facebook.com/granadaturismo). We will be very glad to answer all your queries! Thank you both and I’ll be happy to share to you two can connect. Also, thank you everyone who participated in this month’s chat – the next one will take place on Tuesday, January 3rd (times is yet to be determined as is the chat topic). Until then, happy travels everyone! Hi, I’m in Spain arrived yesterday. Problem is, I was in Spain last year too from 25th-august-2018 to 12th-november-2018. During my entries from Zurich yesterday I was told that I need to change my return ticket which is 12th-may-2019. I am confused with the 90 days calculation. If I have to change my return ticket, which date should I change it to? ?